Choosing a suit cloth is, in some ways, harder than any other area of clothing. Because they all look so similar. If we leave aside the more aesthetic – and subjective areas – of colour and pattern, we are left with dozens of similar-looking suitings differentiated only by technical points of composition and construction. Some of these points, however, are pretty important; others less so. In this post we will attempt to explain the difference, and therefore highlight which ones you should care about. Let’s kick off with some definitions. Most suits are made from worsted wool. (We’ll cover flannels and woollen suitings in a separate post.) ‘Worsted’ refers to the yarn the cloth is woven from – longer fibres are used, and spun into a finer yarn. This finer, sleeker, and more uniform yarn usually produces finer, sleeker cloth – which is why suits look so much sleeker than other woollen products. But it can also be woven into fairly thick, heavy cloth, and finished to look woollier and fuzzier. It depends on what look and feel the weaver is going for. One of the central aspects of suiting is the fineness of this wool fibre. It is measured in microns, and is often referred to by a ‘super’ numbers, eg Super 120s or Super 150s. This is an important area, but also a potentially misleading one. We will deal with it in more detail in a separate post (on ‘superfines’). A second key attribute of worsted cloth is its weight. This will be clearly marked and is measured in either ounces or grams. Generally, a heavier cloth hangs better and lasts longer, but lightweight cloths are often seen as more luxurious and cooler in warmer climates. Whether they are more luxurious is of course subjective, and changes over time. Coolness is more objective, and it’s fair to say that men can generally wear heavier cloths than they think. Weight is driven by two things: the thickness of the yarn and the ‘construction’ of the cloth it is woven into. and how many warp and weft yarns are woven around each other. So for example, a twill will always be heavier than a plain weave in the same yarn, just because a twill is denser and therefore heavier. The construction can also be important in how well the cloth hangs and retains its shape. A denser weave, like a twill, usually performs better in this respect, and is therefore a good option for suits or trousers. Sports-jacket materials tend to be softer and looser. Most weaves are more about the pattern of the cloth than its weight and feel. But those can make a functional difference include gabardine (a twill denser in the warp), barathea (a dense, complicated weave) and satin (which creates the shiny look we associate with the term). There will be another, later post in this series illustrating these weaves – largely in order to understand the aesthetic differences between them. Another construction area that can cause confusion is phrases such as ‘2-and-2’ or ‘2-by-2’. Generally a 2-and-2 weave means that the cloth is woven evenly, face and back, with two threads moving up and down on both sides. 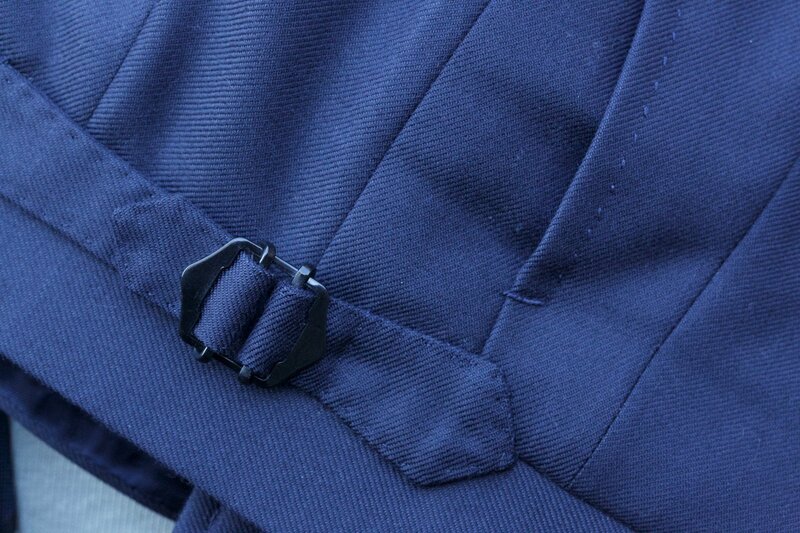 The alternative is a 2-and-1 twill, with two threads on the face for every one on the back. But there is also a ‘2-by-1′, which has a two-ply yarn in the warp (running along the cloth) and a single-ply yarn in the weft (running across it). The weave is even in this case, but the variation is in the yarn itself. This construction is lightweight, but can also be rather fragile. The vast majority of cloths are 2-and-2, although you do get heavier and more traditional cloths in a 3-and-3. Either way, this is towards the more technical and end of cloth attributes. More important is any variation in the fibre that goes into the yarn. Some worsteds, for example, include a small amount of cashmere in them, in order to feel softer (often trying to replicate the feel of superfines). There may be, say, 10% cashmere fibre spun in with 90% wool. At these proportions, the cloth is a little softer but still hangs and performs well. If the amount of cashmere were to be increased, however, it would start to make the cloth spongier and baggy – which is why 100% cashmere is rarely used for suits or trousers. Most other worsted yarns are made with merino wool, though even here there are variations. Escorial, for example, is a merino that comes from a single flock in Tasmania and is particularly fine and springy. 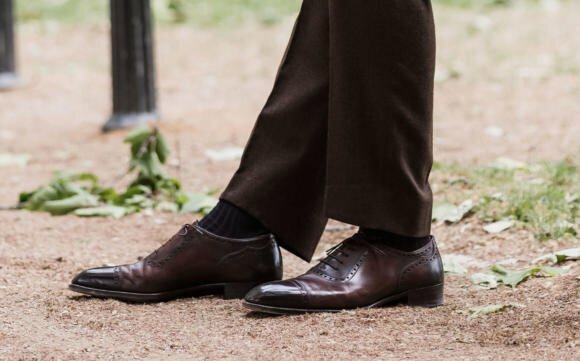 Above: A brown worsted flannel trouser from PA Crowe. Somewhere down the bottom of the list in terms of importance, is finishing. The finishing of cloth – brushing, milling and so on – can vary a lot with woollens and other cloths. But it is fairly consistent with worsteds: they all tend to have a very clean, close finish to give them their sleek, smart appearance. The exception is worsted flannels, which are milled to try and replicate the feeling of flannel, just in a lighter weight. And there are ‘crushed’ or semi-milled worsteds, though these are relatively rare. 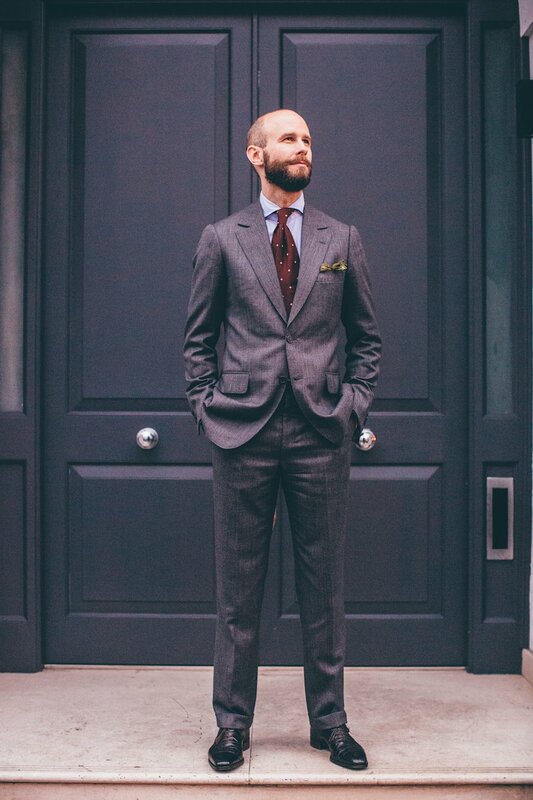 Overall, colour and pattern are always going to be the most important things in the selection of a suiting. But it’s worth understanding fineness and its effects, composition of different fibres, and the various things that go into determining weight. You can follow the discussion on The guide to worsted suitings by entering your email address in the box below. You will then receive an email every time a new comment is added. These will also contain a link to a page where you can stop the alerts, and remove all of your related data from the site. 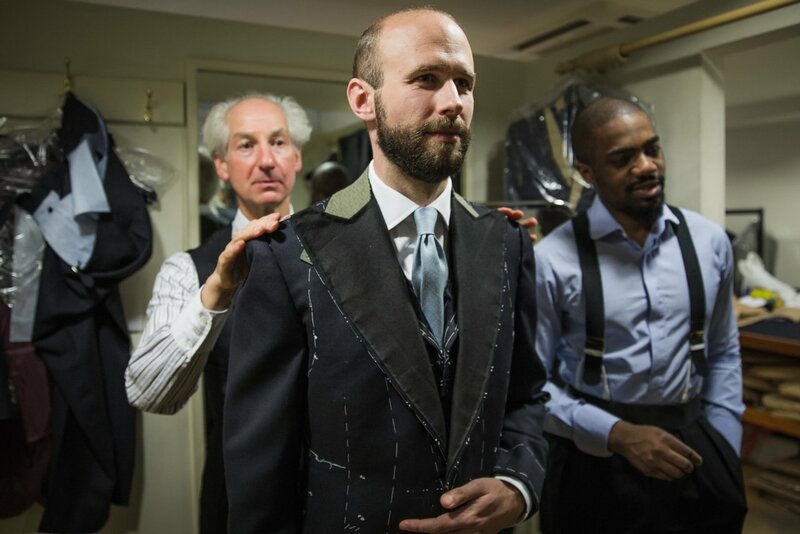 Very interesting, but what practical use is it when choosing a cloth in a tailors shop? Well, hopefully a lot. As I say, the main issues are colour and pattern, which are style points, more subjective, and can only ever be covered in a piecemeal way. Take into account the fact that there is rarely any structural difference between mills (it’s just colour and pattern) and these are the kind of things that can be useful. I have a question about “british” versus “italian” worsteds. I have the experience that cloth from Italy often is quite soft and even “oily” when I feel it and that those from Britain is more “dry” a little bit harder. I compared two different plain worsteds. One was a Super120 Loro Piana Soft Touch and the other was a Super130 suit cloth from Huddersfield Co. They had the same weight but the touch was very different. Do you have the same experience? My feeling is that the italian cloth is nicer but more sensitive. That sounds like it is in the finish, given the fibres are pretty much the same. Some questions about terminology: Does two-and-two only refer to an even twill? And can all two-and-two even twill worsteds be called serge? Can you describe a 2×2 hopsack as “two-and-two”, or is that only for serge? Also, gabardines are often woven 2×2, but aren’t even because there are more yarns in the warp than in the weft and are finished differently. These are some of the most ‘technical’ blogs you’ve written and certainly the most challenging to read. For those of us used to seeing a finished product to try and understand yarns , 2 at the front 1 at back is very difficult to quickly fathom. Regardless of these articles are most welcome . Secondly , how does one avoid the cloth on navy suits becoming shiny ? Thanks, and good feedback. I’ll plan some that take it up a level. And navy question added to Q&A! +1 on how to stop navy worsteds going shiny. Observed this on two business suits last week and wondering if I now need to replace (shame as only a few years old) and if so what to replace with! Up to you on whether to replace, but it doesn’t look good – like fraying edges but worse. Generally, you want to avoid lightweight and cheap materials. Don’t go for super numbers. And consider how you wear the suit – generally it will go shiny at places it rubs a lot, so if there’s anything you can cut out (eg riding a bike in it) that will help too. 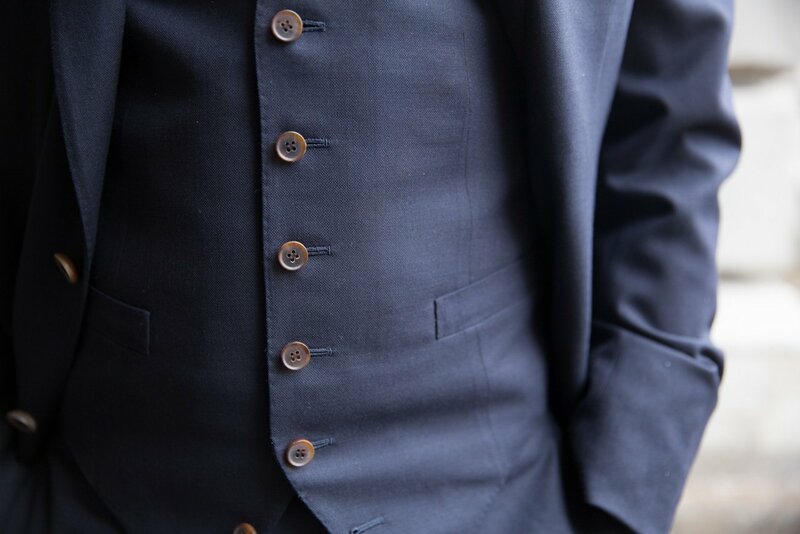 The best advice is to hardly ever dry clean the jackets & purchase extra trousers with each suit to prevent excessive wear from the pressing process. What are the advantages of merino? 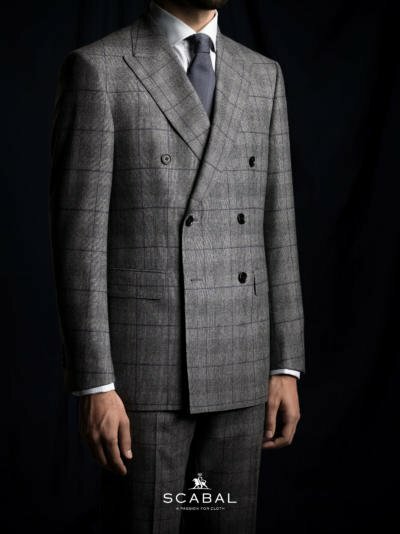 I find it hard to understand how Scabal’ s 290g Cortina cloth listed below can be considered appropriate for the colder months.At just over 10oz I would have thought it would be better suited to a warm spring or summer’s day.The author also describes the cloth as “courageous”. Words fail me. Off-white wool – so ivory, cream etc – for the material. And I would have the lapels in the same material. It’s a showy enough piece as it is, and is meant to be a bit more casual than black tie in any case. What weight/cloth would you suggest? I browsed cloth today and narrowed it down to a either a 10/11oz cream barathea or a 10oz cream twill. Which would you suggest, or should I go heavier? It will mainly be used in warmer climates. Thanks for this very technical introduction. I think we would need time to understand all the intricacies! For now, I would like to know what you think of blend cashmere and cotton used as knitwear. Is such a fabric hard-wearing? And is it suitable for Winter or rather for Spring and Summer? And what about the same blend fabric mostly used for Summer jackets? Generally wool is nicest for knitwear, including cashmeres, but cottons are a nice summer option, and a little cashmere is sometimes added to give it a touch of that wool/luxe feel. Just consider it as a cotton piece of knitwear – which can be cool, but will never have the same drape or natural stretch as wool. I hope you have planed to devote a piece exclusively focused on blend fabrics. Which are the best for suiting and which for jackets ? Such an Insight would be very useful to many of us! @Rabster I hope you’re not cheating and ironing your suit yourself, because that’ll do it. If you must, place a piece of cloth between the iron and your suit to stop the ‘shining’ effect. Simon, I’d like to know how the principal weaves that you find in suiting cloth books (twills, hopsack, pick and pick, plains, birdseye & nailhead) affect drape and performance. Thanks – that’s obviously something we touch on in the piece, but I can expand on it. 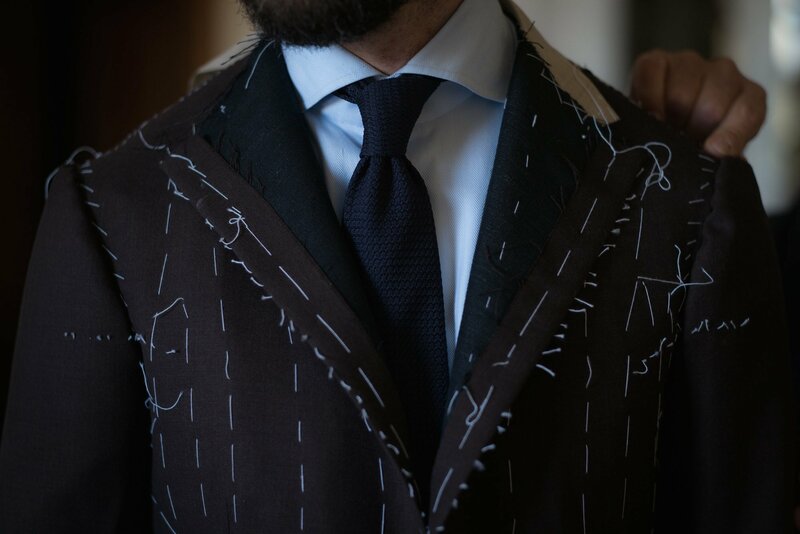 Living in Miami where it is very hot and humid what weight of fabric or weave would you suggest for a suit keeping in mind that if you are buying bespoke you would want something that hangs well and is durable. Also keep in mind that most of the time while wearing a suit will be spent in air conditioning. Hi. If you’re in air conditioning all the time then you shouldn’t have to worry too much. Stay around 11oz – that’s a nice balance between performance and lightness. I have wide legs which wear out trousers very quickly (mostly in the inner part of the leg). I have asked my tailor ” and he suggested to use dry fabrics such as grisaille. Would you agree ? The key things are heavier and hardier materials, and half linings. As thoughts should soon be turning to commissions for the spring, it may be useful for some of your readers if you were to base your next piece in this series on cloths for warmer weather. Sorry Simon as a long term reader I have a few issues with these ‘guides’. They just aren’t very good for the following reasons; by aligning yourself with Scabal there is no proper reference to what the market actually provides (UK has some of the world’s best mills yet no real examples) and it is therefore comprimised and rather academic. Or at least it would be had you provided some reasonable illustrations of weave patterns (the internet is full of them). The ‘2 by what’ section would by far the better if the technical passages were thus illustrated. The same could be said for finishing and weight. For a guide it all seems a bit light and piecemeal? It goes entirely against the grain of Permanent Style wherein real world interaction places it above all others. Thanks very much for your thoughts. I can see all of them except the point about Scabal: given I am not talking (at this point) about any mills and what they offer at all, it doesn’t really matter whether Scabal is involved or not. I can certainly see how this could seem quite academic, but the point is to gradually build up a really good guide, and you can’t do that immediately. I’m using the feedback from these pieces to plan the future direction of it over the next year. Please do keep that feedback coming. Hello again! I will be in London for two weeks in early December and again in mid January. Do you think that is enough time to do a good quality MTM suit for my first foray into custom(ish) suiting? I just need a simple black two-button that fits me beautifully, but I am hoping to spend around 1500 gbp. Where would you suggest for good quality fitting? Thanks for the help! I’m looking to purchase my first bespoke suit and I am currently deciding between H&S Target / Perennial or Dormueil Iconik / Amadeus 365. Do you have much experience with these fabrics? I am just after a conservative charcoal to wear in the office and to meetings. I only plan on wearing this suit once a week. No I don’t I’m afraid, but don’t worry too much about the bunch and brand – focus on a decent weight (11oz and above probably) and whether you like the finish, design and colour. So are you saying there’s not much point in paying a few hundred dollars extra to upgrade from a Dugdale Bros to Dormueil/H&S? The fabrics I’m looking at are literally the exact same to my eye (same colour, twill weave, & weight). I am in Australia and it can get quite hot here during the Summer periods. Most MTM operators here mainly offer 260-280 grams (9-10oz). I noticed in several of your posts you have stated 11oz or 13oz is preferable – and you mentioned that it drapes better and is more durable for more frequent use (and 8+ hour work days). You should be fine in 11oz Wen. And yes, I wouldn’t upgrade for something you’re looking to be a day-to-day suit like this. Hi Simon, great series and a related question on cloth. Am also considering the trade off between the benefits of a heavier suit weight and regular wearability. I tend to travel between New York and Toronto for work and wondering if you would consider stepping up to 13oz wearable year round or, given our summer heat, more of a three season weight? Thanks. Hi Simon. Thanks for all the great articles. I will be traveling to London at the end of the month to place an order for two bespoke suits (as I have a need for a grey and a navy suit) It will be my first time to go bespoke so I am looking forward to the experience. A slight concern I have is from reading comments that the first suit is never done quite perfectly, even with an expert tailor. The second suit in a following order turns out better. As I will be commissioning two suits at the same time, I don’t want to make a big purchase like this and end up with two suits that don’t fit quite right. As I don’t live in London, I don’t have the time to make so many trips there back and forth to do separate orders. That is why I will commission two during this first trip. Would you advise against this for a first time order?